As much as I love to read, I've only ever belonged to one book club. And I have been a member of the same ladies' book club for about eight or nine years. It's comfortable. I know everyone. I know exactly what everyone likes to read. It's comfortable and...predictable. And, while there's nothing wrong with that,...I decided to try something new. One day, not too long ago, I found myself in front of a sign-up sheet while I was out wandering around town. The sheet had a photo of a book cover and said, "If you'd like to read this book and meet up with a group of people who have also read it, we'd love for you to join us for a discussion." The list already had about ten names on it. I thought about it, looked up the book on my Goodreads account (to get a feel for the book), and tried to decide if I wanted to take a chance on meeting up with a group of complete strangers. Of course, it's not really "complete strangers" if they are readers, in my opinion. When you share a love of books, well,...wow,...that's about the best character reference I know of. I also marked the date, time, and place of the meeting on my phone calendar and set myself an alarm. I pulled up Amazon on my phone, bought the book (along with a few others), and had the books sent to my house (love my Amazon Prime). I was set...to try something new! I enjoyed Carolyn Brown's The Ladies Room. It was, as we say where I come from, a hoot! While the base of the story line isn't an original, the cast of characters and the circumstances made it an enjoyable read. In fact, my oldest daughter and I were trying to figure out who should play the parts to make it a lighthearted movie. The book opens at a great aunt's funeral where one cousin, Trudy, overhears her two cousins in the ladies room talking about Trudy "bless her heart" and her cheating husband. Trudy had no idea. The action starts when Trudy has to decide what to do with what she's just found out about her twenty year marriage to her very successful attorney husband. This book is Southern sass and "put you in your place" kind of funny. It also has its sweet and tender moments and insights. It speaks the truths we all know, once we've lived long enough. 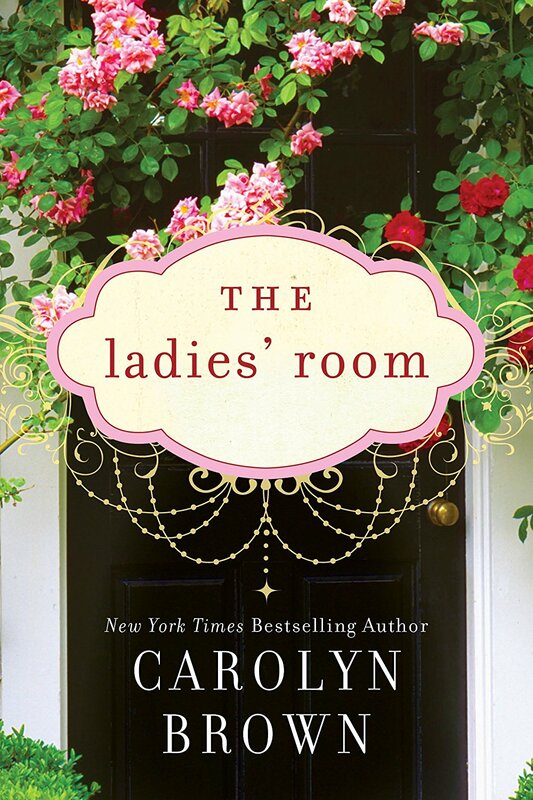 The style kind of reminds me of Joshilyn Jackson's novels, but The Ladies Room is less complex than Jackson's stories. I admit I was a bit nervous when it came time to go to the book group meeting. I wasn't quite sure what to expect. I knew from the names on the list and from the type of book it was, it would probably be all women. And have I mentioned I'm quite a social creature most of the time? Still, I was nervous. I had read the book, of course, but I wasn't sure of how I would be received. Was it always an impromptu book club? Did other people know each other? Would I be the only newbie? I felt a bit awkward, at first. But, when one of the other ladies walked up and welcomed me with a big hug, I knew I would fit right in. They had tables arranged in a square, so we could all face each other. Everyone had their book, everyone had read it (and, trust me, this is not a given in my own book club), and we all came to the same concensus about the book: it was a fun read, but a bit predictable and a bit too convenient. Still, it was enjoyable. We discussed the book the whole time, which I loved, and when we'd finished, a few of the ladies asked me questions about myself. By that time, after discussing the book, I was quite comfortable to share more about myself. My something new...was something I was really glad I did. I'm keeping my eye out for other sign-up sheets. I think it'd be fun to visit various book groups, hear other "complete strangers" opinions, and step outside my comfort zone more often. In fact, I've just found out about a cool, indie bookstore I didn't know about. It looks like they have all kinds of interesting things going on there.